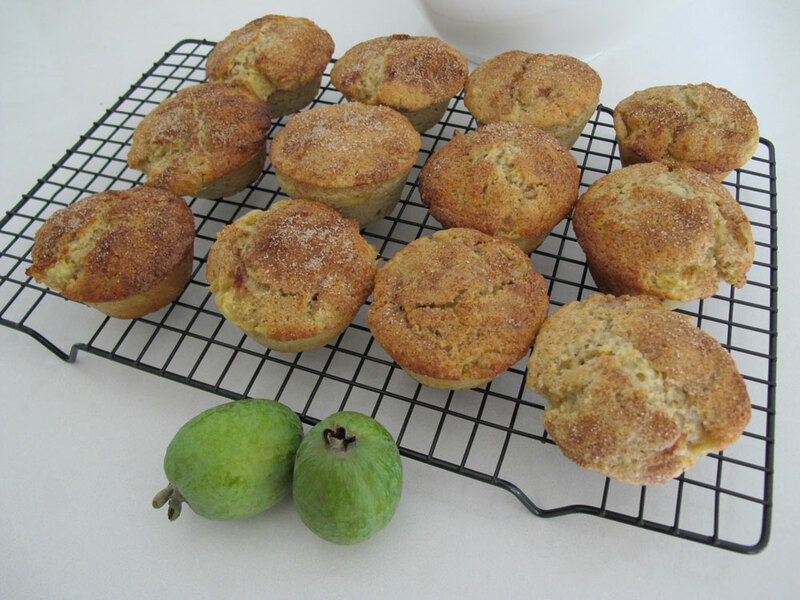 These quick, easy and delicious muffins are from Marvellous Muffins by Alison Holst (Hyndman Publishing, 1994). The orange zest gives them a little zing and I chopped the feijoa a little on the chunky side so I could really taste the fruit. The crunchy sugar topping is just delicious. The proof was in how quickly my little boy devoured two of them. Heat oven to 210°C (200°C fanbake), with the rack just below the middle. Heat the butter in a large bowl until it is liquid. Chop feijoa into pieces no bigger than peas. Pack into cup measure, then mix this into the melted butter with a fork. Add the unbeaten eggs, orange rind, and the juice of the orange (made up to volume with a little lemon juice if necessary). Mix until everything is combined. Divide the mixture between greased muffin pans. Mix the cinnamon and second measure of sugar, and sprinkle it on the muffins. Bake for 10-15 minutes, until the centres spring back when pressed. Variation: For Raspberry and Feijoa Muffins, add an extra ¼ cup of sugar and fold in 1 cup of frozen raspberries.